Patience. Long-Suffering. Endurance. Perseverance. These are not fun words. They are not joyful words. In fact, they are words I’m happy to look past or at least talk to others about them and ignore their place in my own life! However, they are necessary words. They are words that speak to our walk with Christ. Patience is listed as the 4th fruit of the spirit. In the book of Hebrews, we are told to “run with endurance the race that is set before us”. We are also told that “love is patient, kind, it always hopes and always perseveres”. But, when we are in the deep valley, when we are “suffering trials of many kinds”, the last thing we want to be is patient or long-suffering. We want relief now. We seek solutions that will fix the problem or at the very least give a definite direction. We seek relief. We ask for the peace that passes all understanding. I’ve been reminded again and again that when God tells us to “ask, seek, knock and the door will be opened to you”, it does not necessarily mean, ask once, seek for a few minutes, now knock and then the door will open and reveal the exact answer you were hoping for. It can mean asking lots of questions. It can mean days, weeks, months and even years of seeking. It can mean knocking and the door opening. but not to the answer you had hoped for or expected. What is easy to forget is that even though the door opens to an unexpected answer, God is still there with us even with the answer we weren’t expecting. He wants us to learn to be patient, to persevere and at times be long-suffering in our waiting. 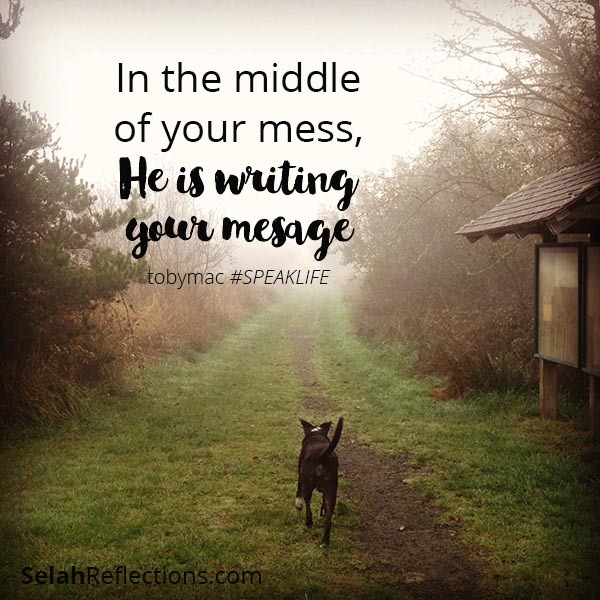 He wants us to be completely dependent on and in constant communication with Him. We don’t always understand what He is up to, and when we are on the valley floor, we don’t always see His hand guiding us step-by-step, decision-by-decision, person-by-person. Many times we can’t even begin to see that until we are out of the valley. And even then, we don’t always know why we had to go through that experience in the first place. Well yeah! I would not have chosen this path, this trial, it’s too hard! Because it feels sticky, it’s messy, it’s emotionally draining, and it feels like we are breaking. To top it all off, we are told to “consider it all joy when you experience trials of many kinds” and to “rejoice always”. Ugh, really!? In the midst of it all, you want me to do what? This one is hard. I don’t do it well, I don’t like to rejoice while I’m in the valley. Joy is not momentary pleasure – it is the deep and lasting condition of our relationship with God this world cannot steal away. It is a manifestation of who He is, a result of the heart-transforming power of Jesus Christ in us. Frustratingly, that heart transformation comes over time, it comes through deep valley travels. It comes with patience, endurance and long-suffering. It comes from walking day-by-day with Christ, in faith, even when we can barely even see the next step in front us. If you haven’t heard of Josh Garrels, you really need to talk to my nieces! They will set you up. Josh is an amazing artist and singer with a heart after God. But out of all the songs I have heard, these 2 lines from the song “Anchor” (he is the featured singer with Beautiful Eulogy on this song) keep coming back to me time after time. 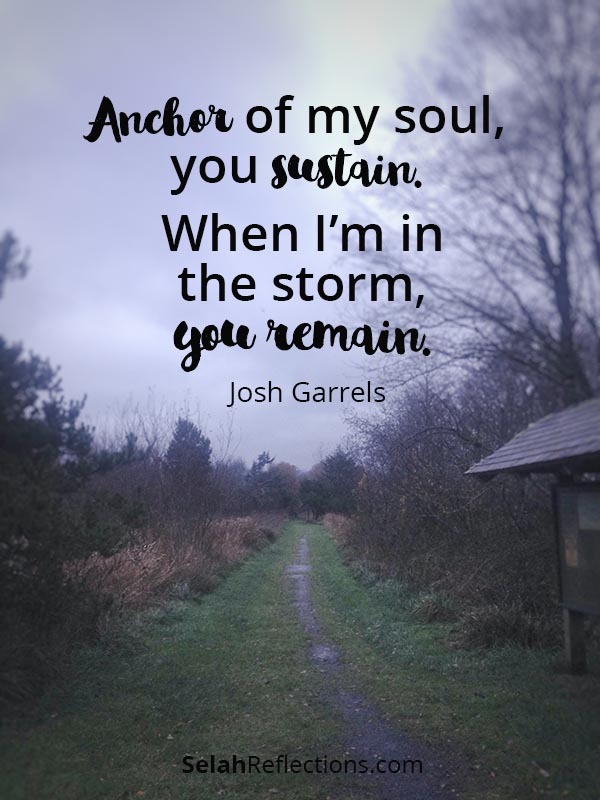 Anchor of my soul, you sustain. When I’m in the storm, you remain. You remain, good to me. Like your own copy of these amazing words? He is our hope, He is our anchor firm and secure. Knowing all this doesn’t mean we will start receiving lightening bolt answers (no matter how many times I beg for them!) or quick solutions to our problems. It does mean, however, that our patient, joy-giving, Abba Father is the anchor of our souls, firm and secure. And that really and truly is all we need. 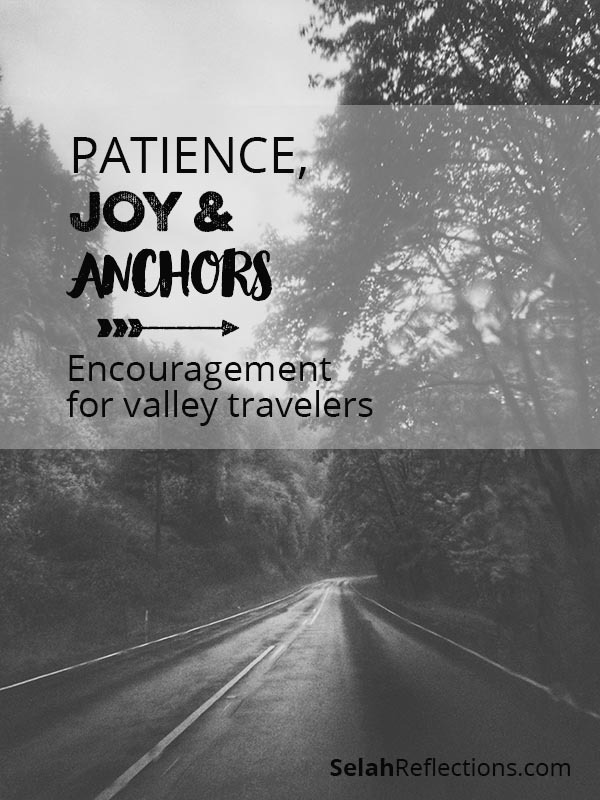 We don’t feel the need for patience, joy, or anchors when the day is pleasant or easy, do we? It’s when we feel overwhelmed, stressed, hurt, or grieved and want relief that those not-so-fun words seem more necessary. No we don’t, we go on our merry way when life is easy – thus I think the need for some valleys along our journey to get our focus back where it needs to be.